You have to be there to experience every nail biting, edge of your seat riveting, and heart wrenching moment Sans special effects, explosions, and T&A, “Prisoners” is a new high in electrifying entertainment. This high-octane vehicle is fueled by not only an engaging story but also fine performances by Hugh Jackman, Jake Gyllenhaal, Viola Davis, Terrence Howard, Maria Bello, and Melissa Bello. Jackman and Howard are best friends and they are having Thanksgiving dinner together when the couples’ two daughters disappear. This horror story unlike most because the monsters are children predators, never lets you catch your breath. Last week at the Shangri-La Hotel in Toronto, Jackman and Gyllenhaal were more than happy to discuss their latest project. Hugh, you’ve gone from a song and dance man to two tour de force performances in a row, Les Miserables and now this. Was it planned? I started as an actor and the first movie I did in Australia was Erskineville Kings, which is dark in a way. When I read this, I thought that as long as we get the right director, this is a potentially great movie that is yes, a good thriller, but can make people think after the movie ends which is a rare thing for this genre. That’s a great question. I feel like I’m on the therapist couch. It used to be the dark and heights when I was a kid but I think it would center around my family and the welfare of my kids. Does being a father change your perspective when you’re doing a role like this? I’m sure it makes it a little more immediate but in the same way that I’m sure that the Ariel Castro case captivates everybody whether you’re a parent or not, there is something elemental about it. We’ve all been parented, we’ve all known that feeling of completely relying on someone. Deep down, if you touch onto that, there is really nothing to rely on, which is a big fear. That’s really what this is about. There’s a line in the movie that actually was not in the script but it really struck me as a parent. I may not of come up with this line if I wasn’t a parent but the idea that how maddening it would be as a father in that situation just knowing that their kid just can’t understand why you’re not there for them. ‘Why aren’t you here? Why aren’t you saving me?’ They’re not thinking, ‘Why aren’t the police here? Why isn’t the ambulance come to find me? Why isn’t the government helping out?’ They’re innocent and they rely on you for everything. So this is elemental to everybody because we’ve all been parented or had some experience of that and I think that’s why the movie resonates. This is a bit like a two-hander between you and Jake would you say? It’s interesting you say that. Jake and I always said that. The frustrating thing about it is that it’s a two-hander. We have these similar paths and we are both lone wolves in a way going about our path and our journey but we only have four scenes together. We hardly ever interact. He’s watching me, and you feel like they’re together a lot. So we really worked hard on those four scenes to make sure that they could hang the movie together. For two relatively low key actors, the both of you are really intense in this. This is the acting bit. (Laughs) Jake is like me. He likes to talk about it. He likes to rehearse. He likes to go over things. He likes to research. I don’t know if you heard but on ‘End of Watch,’ he spent six months in a cop car before they shot one frame of that movie. I love to do research and I did a lot on this. I love that. It helps me because I need to feel that I’ve done the work. 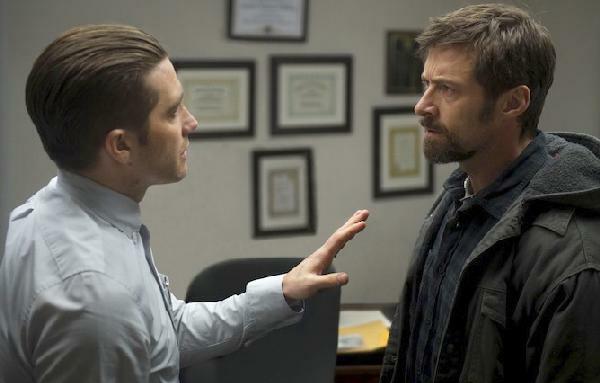 Gyllenhaal is the cop assigned to the kidnapping case and although he is not a parent, his performance is just as engrossing. Jake, how was it this time filling the shoes of a cop? It was fascinating to me. At first, there was a bit of a hesitation because I had played a cop in ‘End of Watch’ and it was coming out the same time that I was asked to play this role. But I thought maybe I wanted to explore something else and Denis (director Villeneuve) and I went into a whole other place. A detective in law enforcement in general has to walk the line and this character has to walk the line between being fascinating and almost infatuated with the mind of a criminal. At the same time, he has to care deeply about the victims and desperately want to find the suspect. I loved the idea of living in a world where both sides were right and wrong at the same time and there was no real sense of clarity in either thing. In terms of being a police officer, I found that this character was so far from the other character that I played. How would you describe your two characters? I think Hugh’s character simply is the beating heart. I think I’m more analytical and the brain, or the mind, of peace. Together, I think we’re the mind. A lot of mistakes would not be made, a lot of regrets would not be had or felt if the two work together. That’s kind of the idea of the movie deep down inside of it. They keep coming together and when they do, it’s interesting how much Hugh’s character is able to confess so much to him. There’s this strange confession all the time emotionally and this vulnerability whenever they’re together more so than any of the other characters; even more so than with his son or with his wife. He’s meeting the other half. I think there is a duality. Denis always talks about the institution versus the individual and that Loki, my character, really represents the institution. Were the tattoos your idea? My thought was I had one clue to his backstory in the script. I was given one line where I say to the priest that I grew up in a boy’s home. That was the one clue I had to his backstory. He was the only character that was so strangely elusive but could so easily fall into. He went through the juvenile detention system and had committed some sort of crimes, be they petty or whatever they were and he was ashamed. So he became a cop because of it and that was another family that he didn’t have.